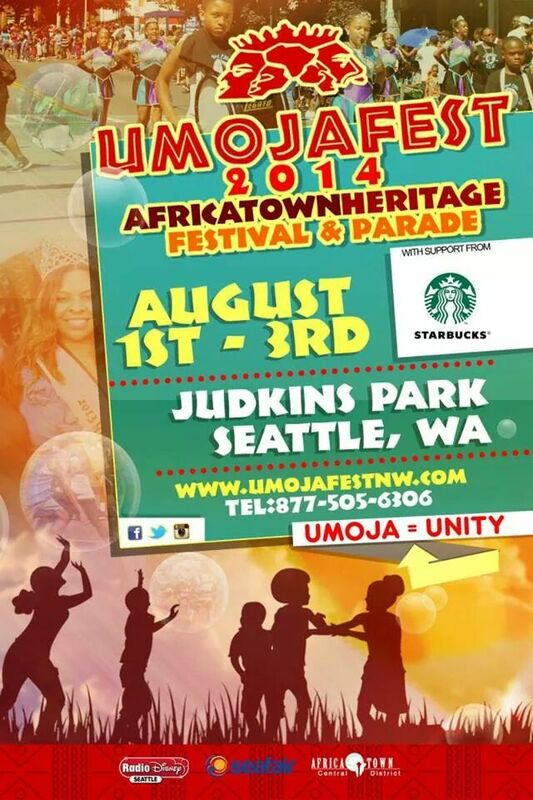 I’m told Umoja Fest has been a reoccurring event for 30+ years in Seattle’s Central District, but somehow I hadn’t heard about it until this year. Umoja = Unity, and this is exactly what this festival is about. Located in the heart of the CD along 23rd ave (Between Jackson & Judson) in Seattle, this weekend saw the ave lined with people sitting in lawn chairs and on blankets awaiting the annual Parade. 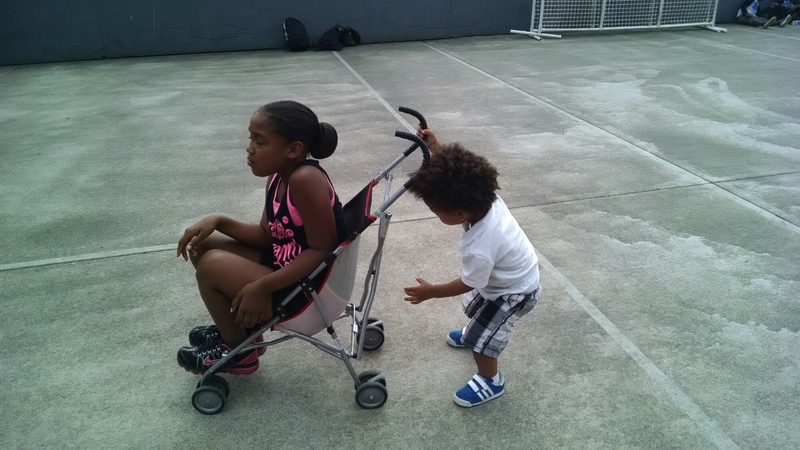 You saw parents strapping elbow pads on their 7 year olds, and filming as their kids whizzed around the skatepark at Judkins Park. 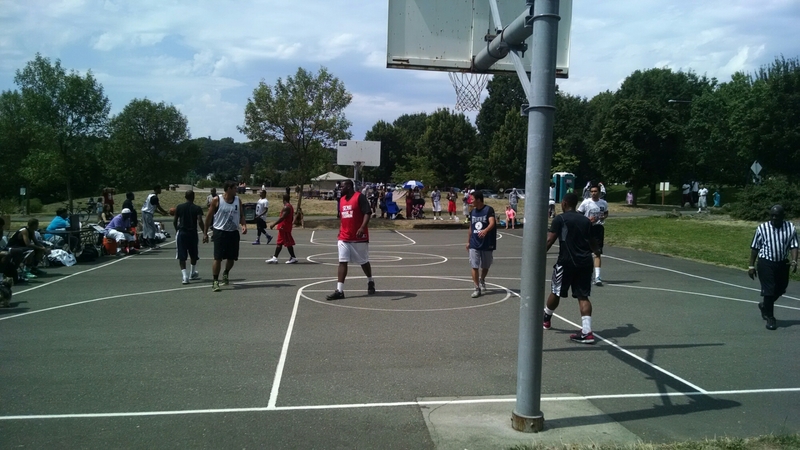 You saw hundreds of people filing in to watch young men playing hoop on the tandem bball courts. With multiple music stages and food trucks, people wandered through the festival with their families and absorbed their surroundings. I noticed a few people sitting around the outskirts of the park, just enjoying the sun, people watching, and the rare opportunity to relax and do nothing for a while. 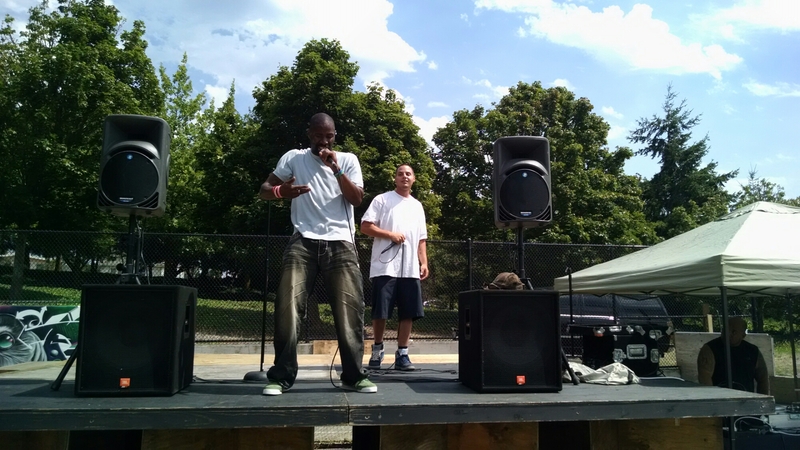 When I arrived I found the Hip Hop stage, which had been setup in a fenced area that looked like it would have been used as tennis courts if not otherwise occupied; located just past the hoop courts. 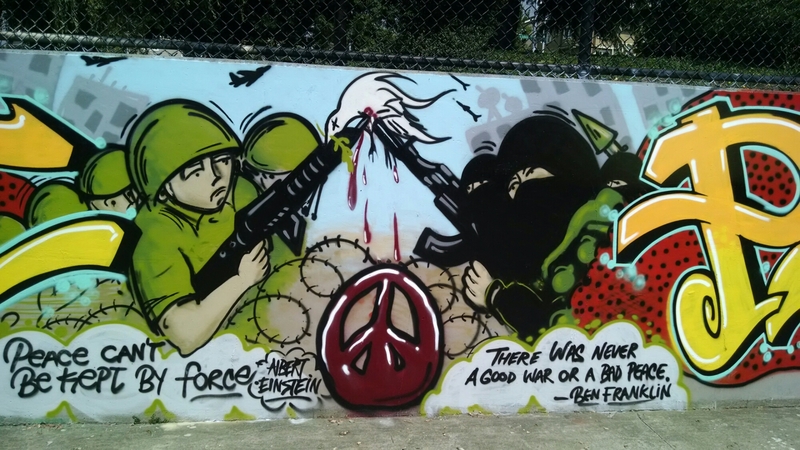 Fresh looking graffiti on the wall on my left read “Free Palestine” along with some famous quotes from the likes of Albert Einstein and an ex President regarding War, Peace and civilian casualties. Welcomed by the host; Veteran Hip Hop Poet/ Writer Josh Rizeberg of Tacoma, we gathered in front of the stage to hear the opening act (and i apologize at the moment I can only recall his name was Gregory) speak about Peace and Freedom, freeing Palestine, ending corrupt wars and occupations, and Power to the People.. Only briefly summarizing his complex political messages. The next act, Skrilla, is a well known Hip Hop artist/ promoter from Tacoma who brought with him his young twin sons for their first ever opportunity to watch their father perform. 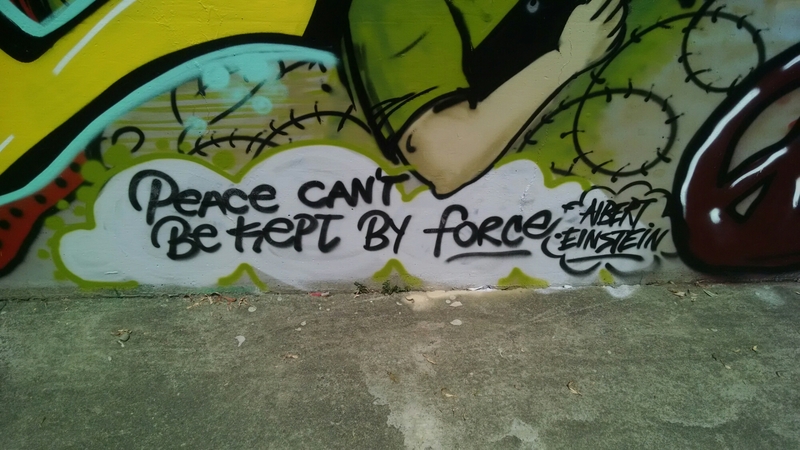 His strong rhymes and catchy choruses echoed the message of the Struggle, life’s ups & downs, and maintaining a positive outlook throughout life’s hardships. 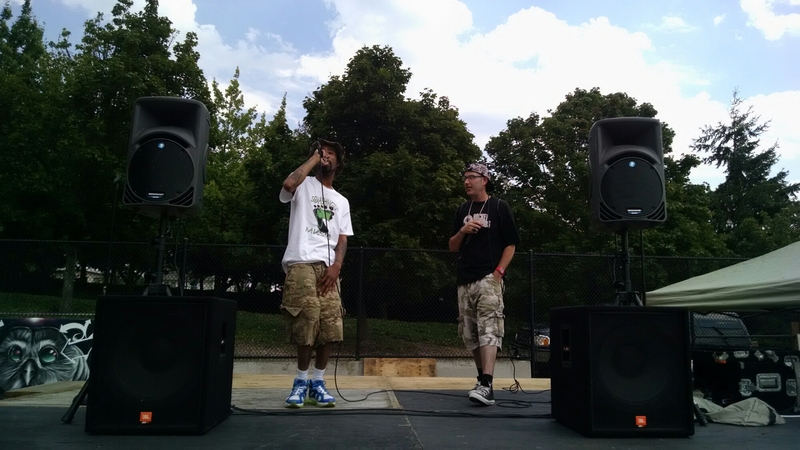 After he thanked the crowd and went to relax with his family under protection of the shade, Rizeberg took to the Mic to introduce the next act; Influential Minds. Accompanied by a guest performer, a young lady who sounded amazing as she sang live (and did not hide behind pre recorded vocals), IM did their thing under the blazing sun and the shadow of the Blue Angel Jets flying over head; from the ever popular Seattle Seafair event which was taking place at nearby Lake Washington. Next up was my good friend and label mate, Thunderchief, accompanied by 5ive 3re; who joined in to perform their song “Up Late”. Thunderchief, who can at times be a bit “wild” or “unconventional”; Delivered a more mature and positive message for the festival goers. With slow, serious instrumentals and clearly spoken lyrics, he spoke to the soul of the people. He even performed a well executed song which (he openly admits to the crowd), was completely freestyled and recorded “in his mommas shed”. When his time was up, he told the crowd he loved them all, thanked them for their undivided attention – then descended the stage in search of water on this still muggy Saturday afternoon. The last act I saw perform was a Seattle artist known as The Sav, who was enjoying the buzz from his newly released album, handfuls of CDs at his side. 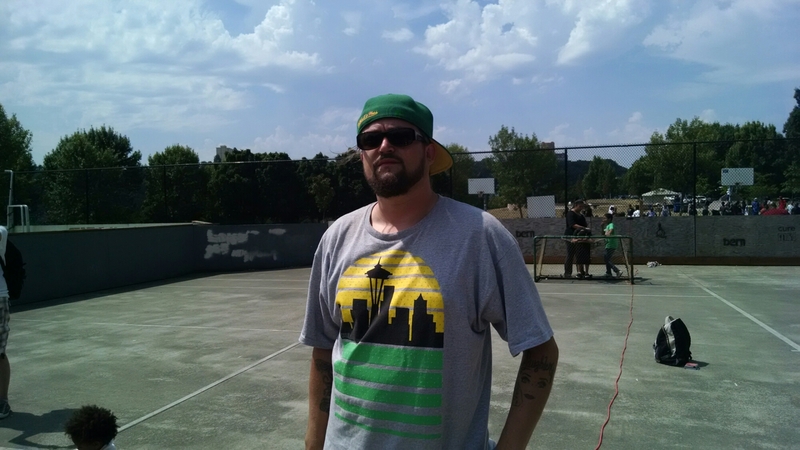 Then we slowly made our way out of the Hip Hop stage area, stopping to hand out flyers and chat with people, watch the kids getting down in the Skatepark, and relax in the grass for a bit before we headed home to BBQ and enjoy the (rare) Northwest sunshine. As I was walking to the truck people were still pouring into the park, seemingly centered around the basketball tournament still underway. Overall it was an excellent event to be apart of, the entire area riding the good vibes of unity, neighbors bonding through similar interests and a sense of community. 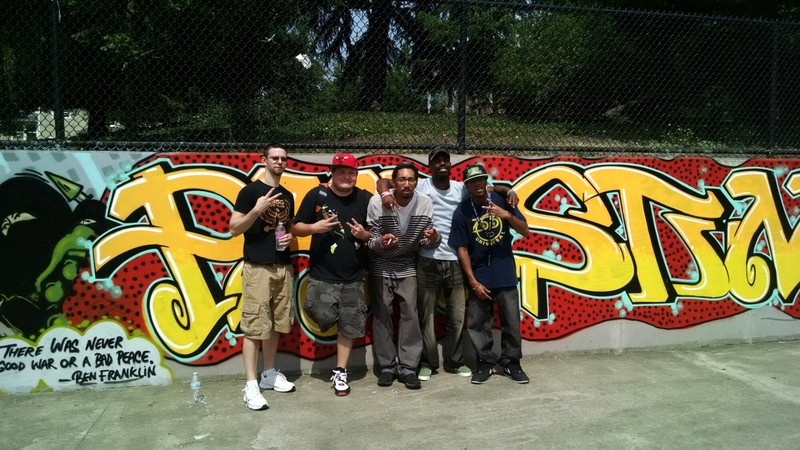 I left the festival with a positive feeling about our Northwest Hip Hop community, and our society in general. I will be a much more informed Umoja Festival attendee when i go next year. Q: Alright, who are you? A: Born in Tacoma, Washington – grew up in Navy Yard City, Bremerton till i was about 12 then moved to Tacoma permanantly the summer before 8th grade. Q: How did you get your moniker? A: I’ve been known by many names thru the years, but the one that stuck was Dubb G.. based on the two G’s in my name, Greg Goucher. Over the years it evolved to Double G and alot of people still refer to me as this.. But once i started going more public with my music and doing shows i started running into Double B, A, C, and the rest, so i decided to look for something more unique. One day Greg Double came to me and it felt like i finally found my identity. A: I write, i rap, i record/ mix and master, promote, perform, throw events, and most importantly i help others do these same things. Q: Why do you do it? A: Because I enjoy the rhymes, the beats and also helping other cats to make music.. I also enjoy creating. I’m more of a technician than a musician, I like building and putting puzzles together.. That’s why I’ve loved making beats and recording/ mixing tracks. My mom sang and my dad was a rocker.. Used to make me listen to pink Floyd and explain the meanings to me when I was a kid.. Then I found rap when I was like 8, I started memorizing songs and writing down verses from Eazy and Mixalot, eventually started writing original rhymes and making beats in highschool. I enjoy performing, and I love the community aspect of it.. Building a network/ helping people meet others when they need something. Rap music has been the most steady thing in my life since i was 8 or 9. Q: How long have you been doing it? 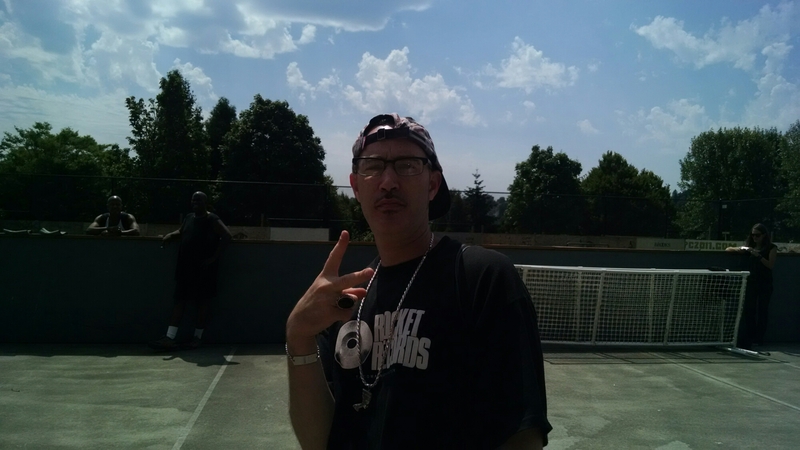 A: Writing my own rhymes since 8th grade, about 1995 – recording and making beats since 10th grade, around 1998. So i’d say ive been doing this for 19 years. Q: How did you end up with BNM? A: Blue Nose Music is something i thought up years ago when i was making music with my buddies; Ryan, Zuriel, Neal and Lay Lay (Thunderchief).. i was obsessed with Blue Nose pitbulls so i started calling my music Blue Nose; at the same time i was making Dark more Horrocore sounding beats and songs and calling it “Haunted Records”. I eventually went my own way from what we were doing and i let my homies take HR, and i kept pushing with the name Blue Nose Music. Q: What do you see your purpose as? Q: Where do you want this to take you? A: You know, I’m hell of excited about this Distribution deal with Fahrenheit & City Hall, as a long time fan of First Degree The D.E. and as some one who wants his music in the hands of every listener in the world. BUT I’m happy with my daytime career as well, and i don’t really have wild aspirations about Grammy’s and Whammys or the typical “Rapper” lifestyle. I’d love to tour and sell music & merch to people who enjoy it. A: To every one who listens to our music and supports Blue Nose Music, every artist i’ve worked with over the years, those who helped me build this BNM thing, producers that’ve trusted us with their beats, any artist that’s collaborated with me, any venue owner who’s given me a chance to throw a show at their club, my girl for supporting my craziness and trusted me when i said i was going to keep doing this and took me serious, my people behind the scenes like Mike Groshong – without whom Blue Nose would be a fraction of what it is, and accomplished a fraction of what we have. 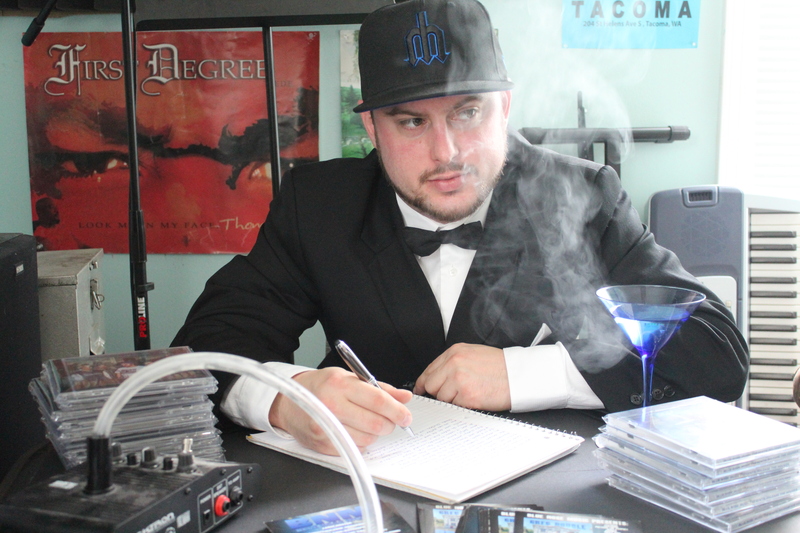 First Degree The DE and Fahrenheit Records, for the continued support, guidance and opportunities – S/o to all my BNM family: 5ive 3re, Castro, Thunderchief, Easie,Chuey, Mac 9, Karly M, Chris M, Jacob B, Zuriel W, Ryan Kelly, Gamble and the list goes on. I know for a fact i have failed to name everyone and i apologize if i didn’t name you specifically.